For the first time under coach Cherise Hinman’s 16-season tenure as head coach, the Lady Eagles volleyball team will host an invitational tournament. Boulder City and more than 20 teams that will play Friday and Saturday at both the high school gym and the Boulder City Recreation Center. Each team will play at least four matches in a pool-play format with the top teams advancing to an elimination round. “The district makes it harder and harder to travel to tournaments each year, so I decided to put on our own event,” Hinman said. “Right now, we open each year in the Las Vegas Invitational and we have been on a waiting list to get into the Durango tournament. I thought this gave us and a lot of other teams a chance to play a few extra matches in a tournament format. A player excited to have a home-court tournament is senior hitter Whitney Barlow. In all, it is a very busy seven-day span for the Lady Eagles with three Sunrise League matches scheduled, along with the tournament. The Lady Eagles open their Sunrise League schedule tonight at Desert Pines (0-3). After the two-day invitational, the Lady Eagles will play Tech (0-2) at home Monday, followed by a trip Wednesday to Overton to play Moapa Valley (5-6). All three start at 6 p.m. The Lady Eagles stand at 3-6 on the season after a split this past week. Boulder City had their first home match Sept. 12 against defending Southern Region champion Faith Lutheran (4-5). Although the Lady Eagles surged to a 20-11 lead in the first game, Boulder City lost all three to the Crusaders, 26-24, 25-14, 25-19. 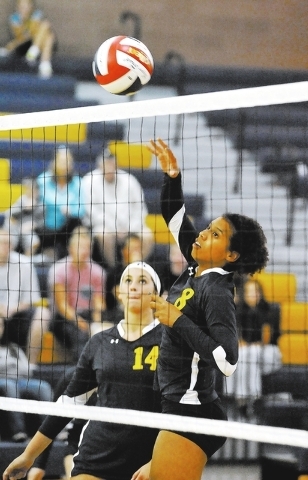 Barlow had 11 kills and two blocks, while senior Kendall Miller finished with 13 assists, 11 digs and three aces. Junior Alyssa Ybarra had 20 digs. On Tuesday at Basic (3-2), the Lady Eagles won a grueling five game match 22-25, 25-23, 25-13, 22-25, 15-13. Ybarra had 32 digs and three aces, Miller added 46 assists and Barlow had 32 kills. The boys and girls teams had a meet Wednesday after deadline against Sunrise League opponents Chaparral and Tech at Hemenway Park. The teams’ next match is this Wednesday against Desert Pines at 4:30 p.m. in Boulder City. Senior Jordyn Syler shot a round of 94 to finish second in a league match Sept. 12 at Wildhorse. The Lady Eagles finished second with a team scored of 442, 10 strokes back of match winner Tech. Moapa Valley finished third with 451. Senior Mariah Harvey finished seventh, and junior Kelli Harfield grabbed 10th in the meet. The second place finish was an improvement on the third place finish the team recorded their first outing Sept. 3. Thursday’s league match at the Municipal Course has been canceled because of the extra maintenance needed on the course after the recent heavy rains. The team’s next match will be a league match Wednesday at Las Vegas National. Senior Yann Moncayo scored five goals as the Eagles (2-1-1) crushed visiting Adelson (0-4), 11-3, on Sept. 12. Junior Victor Andrades had two goals and four assists for Boulder City, which lead 9-0 at the half. Seniors Kurt Steinke, Nicholas Walker, Marcus Walker and James Walsh all scored, as did freshman Hunter Dale. On Tuesday, the Eagles lost their Sunrise League opener at Chaparral (3-1), 2-0. Boulder City hosts Foothill (3-3-1) today at 3 p.m. in a nonleague match. Sunrise League opponent Sunrise Mountain (2-1) visits Monday, before the team travels to Desert Pines (2-0-1) for a league match. All games start at 3 p.m. The Lady Eagles were unable to hold an early 2-1 lead, dropping a 4-2 decision to visiting Cheyenne on Sept. 11. Jane Nevarez and Vilde Svendsen each scored in the game. On Tuesday, Boulder City (1-2) hosted Chaparral (1-2) in the Sunrise League opener, losing 7-2. Jeanne Carmell and Jana Williams each scored in the loss. The Lady Eagles travel to Foothill (3-4) today for a nonleague match, and Sunrise Mountain (1-4) on Monday, before hosting Desert Pines (1-3) on Wednesday.